Sharp Detectives Private Limited is the most trusted Detectives Agency actively operating throughout India. Our Detective Agency also executes foreign Investigation assignments. Sharp Detective Agency is the No.1 Detective Agency in the world with very strong Network of super specialist Agents in and around Africa, Australia, Bangladesh, Canada, Dhaka, Dubai, Europe, Gulf, India, Iran, Iraq, Japan, Kuwait, Malaysia, Mexico, New Zealand, Pakistan, Russia, Saudi Arabia, Scotland, Singapore, Srilanka, UAE, UK, and USA. Sharp detective agency are in the business of Private Detective & Investigation since 1978, employing more than 600 Full time Professional Private Investigators on our payroll and having more than 1000 on our panel operating around the world. Our R&D team consists of well-qualified technical experts working round the clock to support & enhance our services technically. 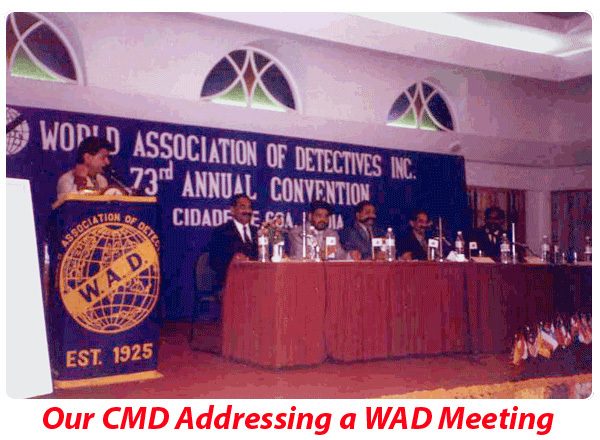 Our competence and excellence can be assessed from the fact that we were adjudged the Best Detective Agency of India, during the years 1989, 1995, 2001, 2008 and 2011. Our Detective Agency has been licensed for the last 34 years and we are in the business since the last 70 years & our present Chief is a Senior Ex-Military Officer. He took over charge from his father, who was also a Senior Ex-Military Officers & the founder of these businesses. Our biggest strength is that we are a Fourth Generation organization Detective Agency with all renowned accreditation associations throughout the world. We always take our assignments and problems of our existing and prospective clients very seriously, by defining and keeping in mind the aim and objectives of our assignment. It is admittedly impractical for the police alone who are over burdened and whose sphere of investigation is limited to Cognizable offenses, to meet the challenge of the prevention of all crimes. It is ideal to leave the police free, to tackle only the grave crimes. Hence our Agency has a vital role to play in successfully checking the spread of personal and commercial crimes before it destroys our clients. As on date we have consolidated our position in every nook & corner in India and even spread abroad and grown many folds in Private Investigations, besides having a very large Security Guarding Division but our interest & hunger for highly challenging and risky assignments, we have concentrated upon our Detective division almost to a level of perfection. We undertake all type of investigations, unconcerned about the risks they involve, as long as they are within the confines of Law. There are numerous cases where the Spouses, before the marriage, have physical & mental relationship with someone else, but due to many a reason gets married elsewhere. Sometimes, this relationship continues even after marriage and on being detected, the marriage sails through rough weather and mostly sinks. When detected by the spouse and during the subsequent life span one feels cheated, anguished and thus spends a miserable life thereafter. We investigate and analyze these matters, thus avoiding the traumas by our in-depth investigations. We are specialized in Private Detectives, Investigations, Matrimonial, confidential verifications and inquires for business as well as personal investigations. We provide a wide range of background checks, assessment tools and character screening Services. We have a dedicated team of trained professional Detectives. Our selected and screened investigators equipped with all latest high-tech investigation equipments and has undergone the extensive training to perform their duties with sincerity and taught several tools so as to generate the best results in the shortest possible time. Our qualifications, expertise and Services are best evidenced by our clients. We focus on providing our clients with the information they need and giving it to them in the right context. Whether it is due diligence, background checks (personal or corporate), private investigations, financial profiles, litigation support, competitor analysis or a marketing research, we give it to you within your time frame and budget.